This Mediterranean-inspired salmon burger recipe can be made during any season, and any weather, thanks to the burger’s quick stovetop cook time. No grill required. 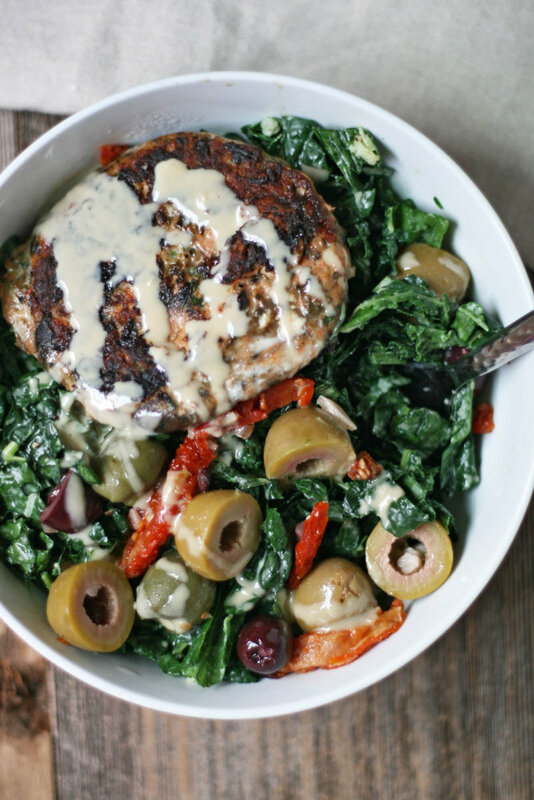 Even better, do a healthy hack and serve your salmon burgers over a bed of kale and other Mediterranean flavors, and you’ll crave burgers all the time. Just because burgers are ubiquitous in the food world, does not mean that they are the healthiest option. Conventional and fast food burgers are often made with factory farm raised beef, refined industrial oils, artificial flavors and preservatives, and a whole host of other nasties. To counter that, enter salmon: the easiest way to give your burger a healthy makeover. Salmon burgers are nothing new. 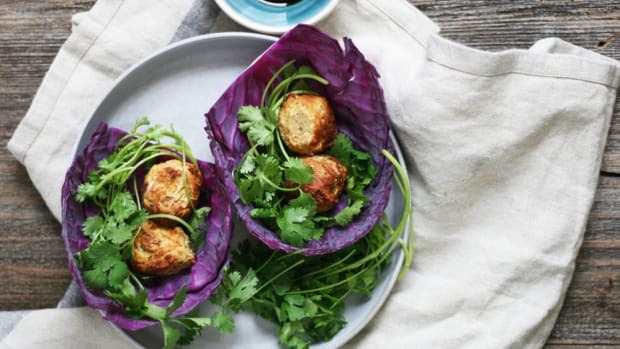 Their versatility lends their flavors to be easily transformed with Greek, Italian, or Middle Eastern tastes all by simply adding different herbs, spices, and seasonings. All these salmon burger options are a surefire way to please picky eaters and get a dose of healthy whole food benefits as well. Salmon is considered an anti-inflammatory food that is filled with a wide array of amino acids, omega-3 and omega-6 fatty acids, and nourishing vitamins and minerals for total body support. 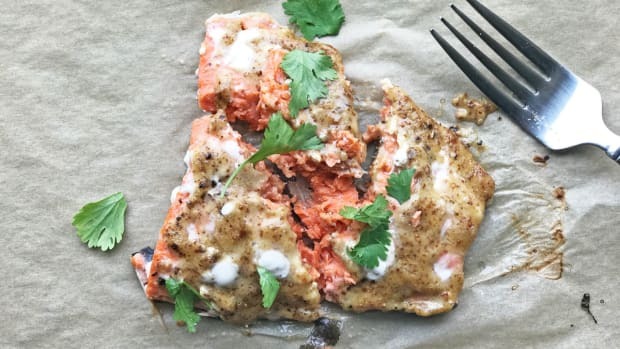 Just four ounces of wild salmon provides 236 percent daily value of vitamin B12, 128 percent DV of vitamin D, 78 percent DV of selenium, 55 percent DV omega-3 fats, 53 percent DV protein, as well as phosphorus, vitamins B3 and B6, iodine, choline, biotin, and potassium. Notably, salmon is considered king of the omegas. Omega-3s are thought to improve control of the body&apos;s inflammatory processes while reducing total inflammation, provide support to cell function, support the transfer of information between the body&apos;s cells, and keep our brains functioning up to speed. Within salmon, half of the omega-3 fat content is found in the form of EPA (eicosapentaenoic acid) while a slightly lower amount exists in the form of DHA (docosahexaenoic acid). Both EPA and DHA are essential to the human diet, and our body utilizes both types of omega-3s differently throughout our lives. In the womb, adequate amounts of DHA are needed for the growth of the brain, central nervous system, and retina development. While in children, DHA is necessary for normal growth and development of body systems. As the development of the brain and central nervous system start to reduce around age five, the body’s need for DHA decreases while the need for EPA increases. In fact, low levels of EPA in teens and and adults have been found to correlate strongly with development of mental health issues, depression, dyslexia, heart problems, joint and bone conditions, as well as neurodegenerative diseases such as multiple sclerosis and Parkinson’s. EPA also works as an anti-inflammatory agent to protect our genes and cell cycle from oxidative damage, as well as a helper in maintaining our normal stress response. 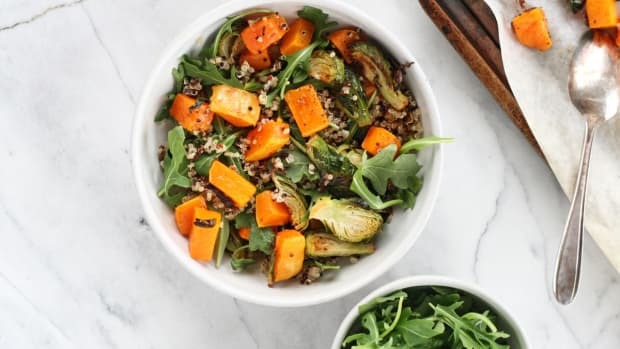 Between the ages of five and 65, the body’s need for EPA omega-3s can be met with regular consumption of fatty fish such as salmon and mackerel, fish oils, marine products, organic greens, and organic pastured animal products. Supplementation with high quality fish oils can also help individuals meet EPA requirements. Of course, now that you know just how much of a nutrition and omega-3 fatty acid superstar salmon is, it’s time for the next big rundown: wild or farm raised salmon? As a nutritionist, I’m team wild all the way. I urge you to splurge a bit more and buy wild-caught salmon usually labeled as Sockeye, Chinook, Chum, Coho, and Pink, which are harvested from wild fisheries in the Pacific Ocean. Atlantic salmon, on the other hand, is primarily farmed raised. Not only does wild salmon taste far better, it hasn’t been given a host of antibiotics and unnatural food while being raised. Farm-raised salmon are fed a very poor diet of grains, corn, soy, and antibiotics which leaves the salmon with a grey tint, completely unnatural from the beautiful color of wild salmon. To combat this problem, farm raised salmon are given chemicals and dyes to achieve that perfect salmon-like hue. Sound appetizing? Research published in Science determined that farm-raised salmon had more dioxins and chemicals like polychlorinated biphenyls (PCBs), which the Department of Health and Human Services has deemed a carcinogen, than wild salmon. Eleven times more! Not to mention, farm-raised salmon is banned in Australia and New Zealand. 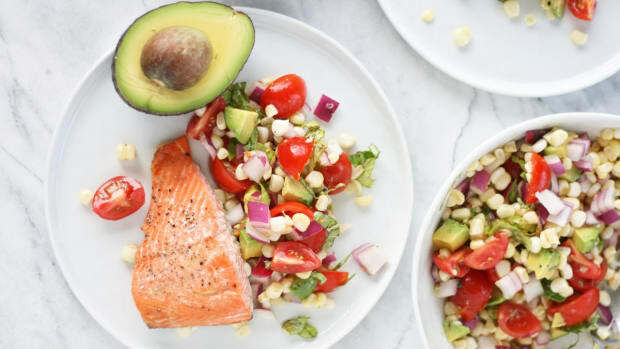 On top of this, wild salmon contains more zinc, omega-3 fatty acids, calcium, iron, potassium, and less saturated fat than its farm-raised impostor counterpart. So, the next time you&apos;re at the seafood counter, splurge a bit more for the wild stuff and reap better health for the planet and your body. 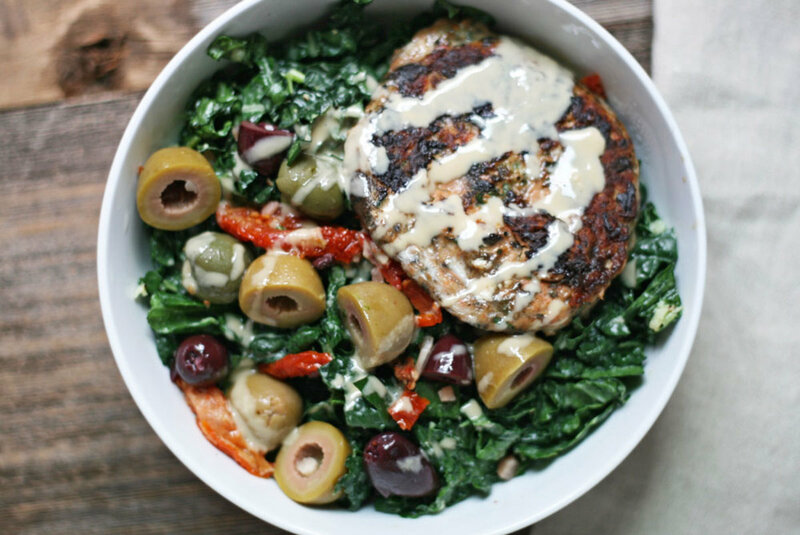 Wild salmon plus Mediterranean flavors and a bed of kale is nothing short of health burger heaven: we&apos;re so in. Pulse wild salmon a few time times briefly in a food processor until well chopped and slightly sticky. Add chopped salmon to a large bowl and stir together with minced garlic, fresh chopped herbs, cooked quinoa, eggs, spices, sundried tomatoes, balsamic vinegar, salt, and pepper. Mix well to combine all ingredients. Shape the mixture into four equal sized patties. Heat a small drizzle of oil (avocado or olive oil) in skillet over medium high heat. Fry the patties one at a time, flipping once after 3-4 minutes. The patties should be golden brown on the outside and fully cooked on the inside. 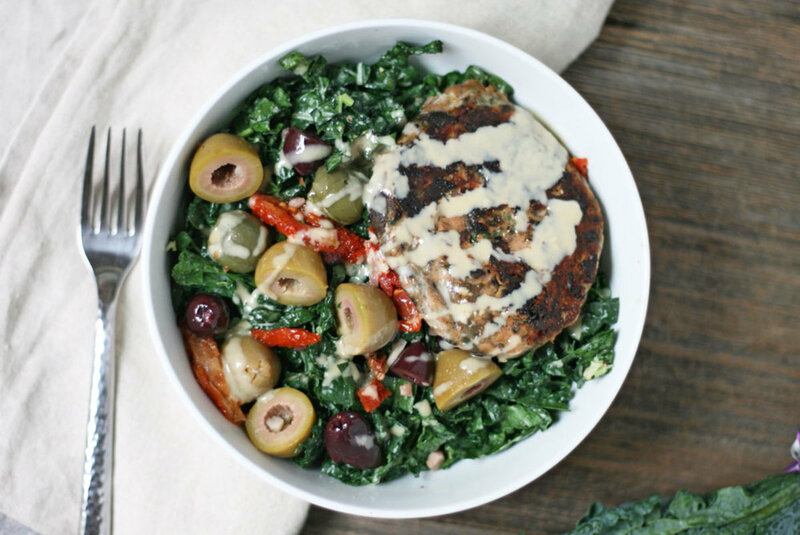 Serve Mediterranean salmon burgers over kale salad! 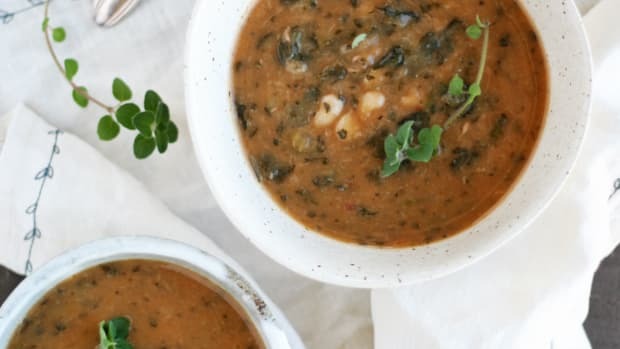 Simply chop one head of dinosaur kale and add to a bowl with 3 tablespoons of each olive oil and balsamic vinegar, along with one clove minced garlic, and one tablespoon of prepared mustard. Massage kale to coat completely and season with sea salt and pepper. Add in olives, sun-dried tomatoes, chickpeas and more if desired. 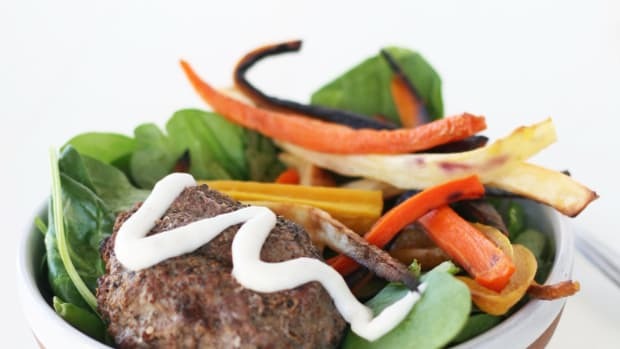 Drizzle with creamy tahini dressing and enjoy! A delicious Paleo recipe can be made in just one sheet pan in less than 30 minutes. 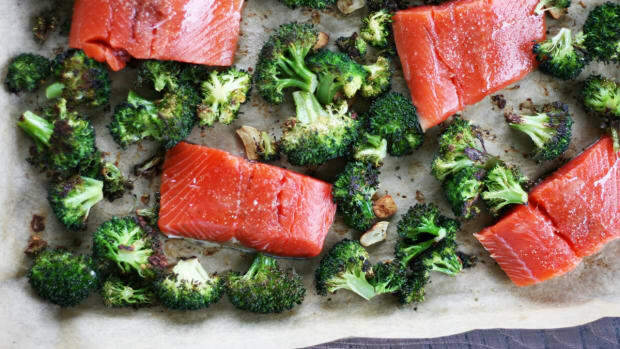 This Asian salmon and broccoli recipe is easy and healthy! 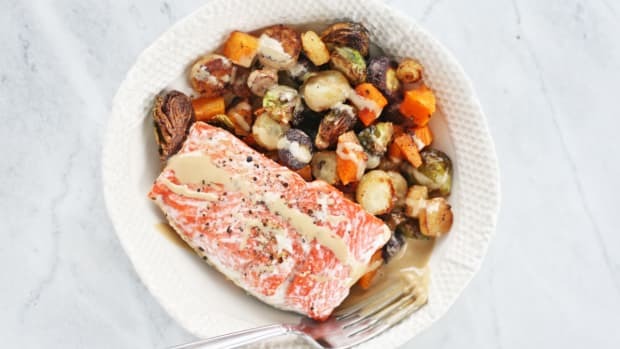 Make the easiest meal ever with this roasted vegetable and wild salmon one-pan dinner with a delectable maple and tahini dressing.